The Ka Nefer Nefer mask, subject of two lawsuits in federal court, seems likely to stay in St. Louis for the near future. On Monday the U.S. District Court dismissed the U.S. Government’s forfeiture claim for the mask, as Rick St. Hilaire reported. The St. Luis Art Museum also has a parallel declaratory judgment action seeking to prevent the government from pursuing a forfeiture in the future. You can generally read the tea leaves in the first few lines of a court opinion, and when the court wrote “the Government boldly states that it seeks the forfeiture of all rights, title and interest in a 3,200 year old Egyptian Mask . . .” you have a pretty good idea that the U.S. attorney was not able to convince the court to forfeit the mask. It most certainly was involved in a crime, yet the government was unable to allege enough “circumstances” surrounding the mask’s journey from Saqqara in Egypt in 1952 to the antiquities market some time later. The government undercooked its legal analysis of the illegal activities giving rise to a forfeiture in its first forfeiture attempt here. For now it may amend its complaint. If it does, it should perhaps note that Egypt has laws establishing ownership of its antiquities, and there is no set of circumstances under which this mask could have rightfully left Egypt. Perhaps noting that may lead to a different result this time around. The Government cannot simply rest on its laurels and believe that it can initiate a civil forfeiture proceeding on the basis of one bold assertion that because something went missing from one party in 1973 and turned up with another party in 1998, it was therefore stolen and/or imported or exported illegally. The court was concerned that the government failed to establish precisely how the mask became stolen property. There is plenty of precedent on point for this legal principle, but the lawyers for the government failed to include enough of it in the complaint. Now the U.S. attorneys will have to return to the drawing board and establish a firmer legal framework for the illegal removal of the mask from Egypt. Making the government’s task more difficult, is the lack of evidence provided to them by Egypt establishing how and when the mask was stolen. As a consequence, if I was working on the case, I’d essentially treat it like an antiquities looting case. The theft itself is lost to history. But you don’t need those facts, just enough to put the burden back on the museum’s case to show how far back its chain of title can go. The museum will likely respond that it had no reason to believe the Aboutaam brothers were antiquities dealers to avoid in 1998. Was it established that they routinely dealt in looted objects in 1998, even if that can be established now? The SLAM conducted a search, and while certainly not ideal, it posed questions to officials in Egypt. For lots of background on the mask, see here. 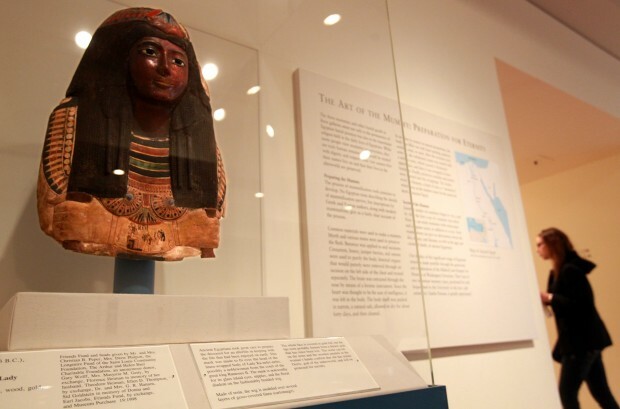 We can ask whether the Museum should do the right thing, but the government attorneys had an opportunity to force them to and failed to allege enough concrete circumstances in its complaint to trigger what would have been a very uncomfortable forfeiture proceeding for the museum—one that coupled with reasonable public pressure exerted by Egypt would have certainly made continued possession of the mask in St. Louis untenable.